What will happen if your important documents, ledgers, invoices, accounts, etc. are destroyed in a fire? The consequences can be financially disastrous for your company.Lion Fire Resistant Filing Cabinets have built-in, long lasting reliability and are specially designed to withstand temperatures up to 900 o C for one hour. 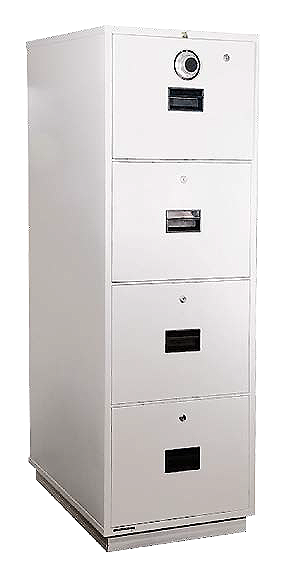 They are also built to withstand considerable impact in the event of the cabinet crashing through the floor in the course of a fire.For your peace of mind, get Lion Fire Resistant Filing Cabinets in your office today! Top Drawer lockable with either a Combination Lock or a Digital Lock. Each drawer comes with an independent key lock. The top drawer can control access to the other drawers if set up or each drawer can be used individually. The Fire Resistant Cabinets are of tongue and groove construction which not only acts as a heat seal between the drawer and body but a vapour barrier as well.